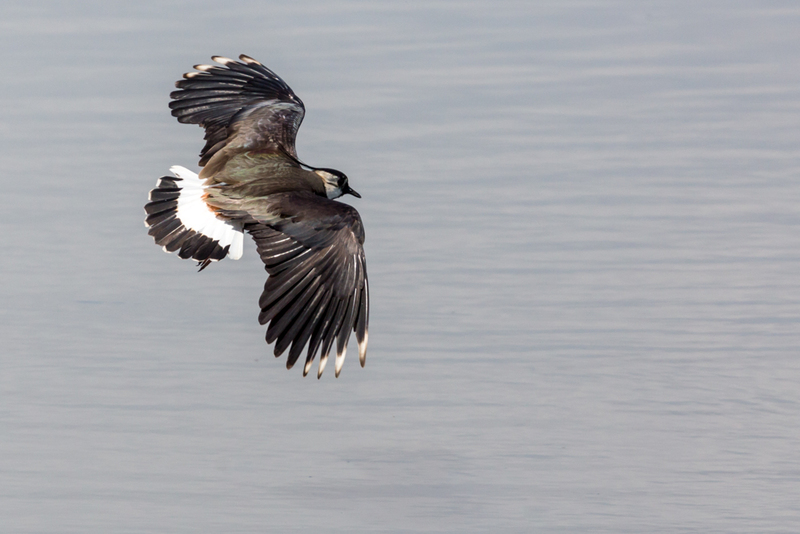 The highlight of the day was undoubtedly the three Lapwing chicks in front of the Morgan Hide. 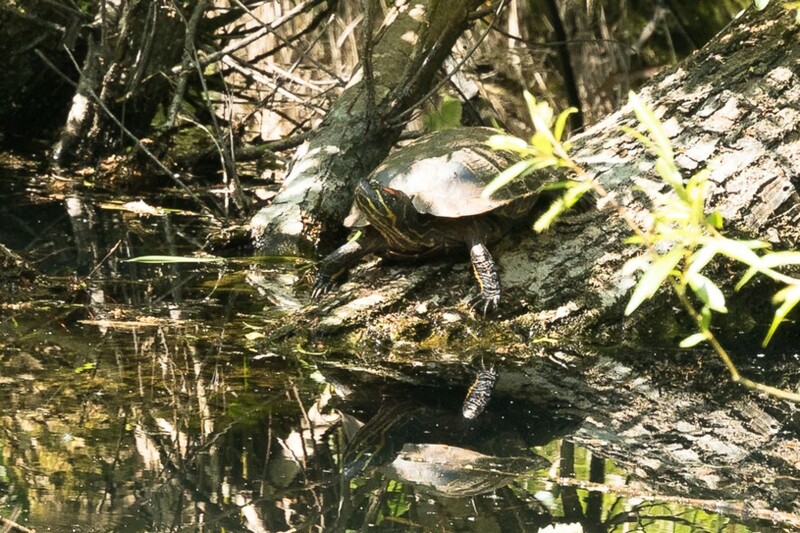 The adults moved the three young off the shell island to the next island where they will be less exposed. The young, one of which only hatched that morning, were encouraged by the parents to swim to the next island. The first two crossed fairly promptly but the third (probably the youngest) took more persuading but I understand it eventually crossed over! 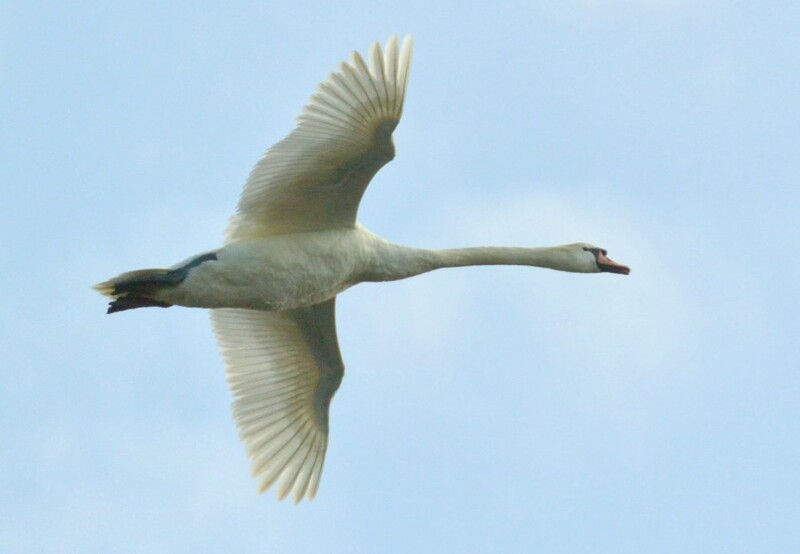 Also present was a Mute Swan brood of 6 small young and a Black-tailed Godwit. 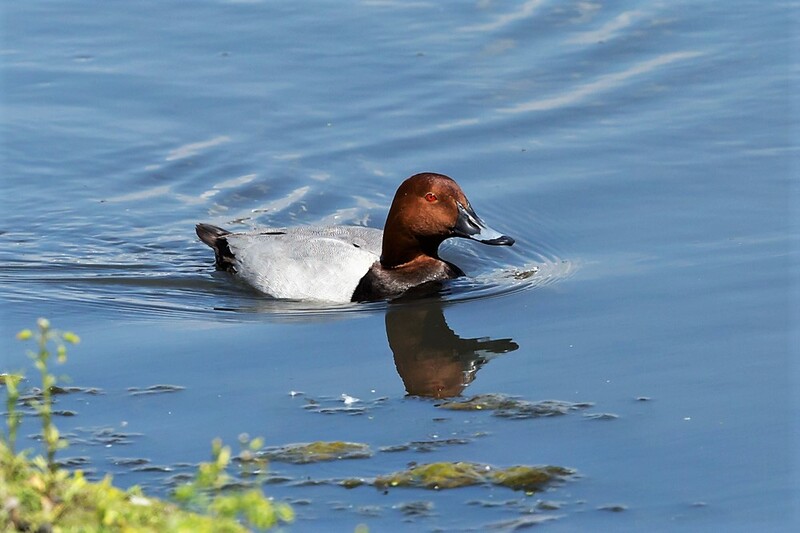 On the Loop of No.4 bed were a minimum of four and almost certainly five Pochard broods. 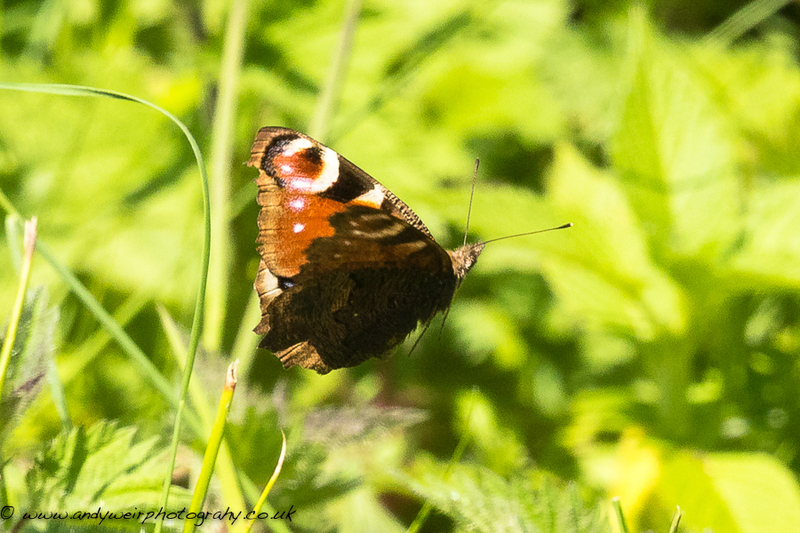 Butterflies included 3 Painted Ladies and 8 Common Blues. 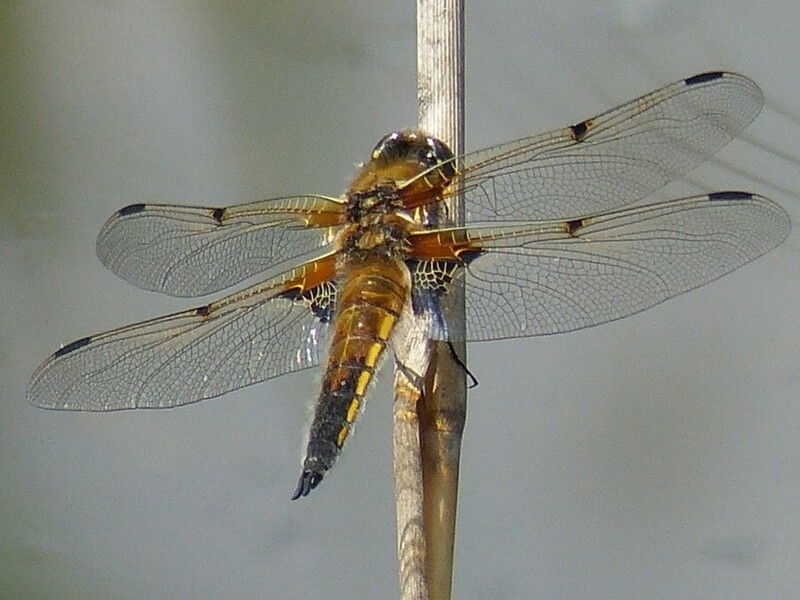 An Emperor Dragonfly and several Four-spotted Chasers were on No.1 bed today together with numerous damselflies. The drake Garganey, last seen on the 27th, was seen again this afternoon briefly as it crossed the channel from the south screen. 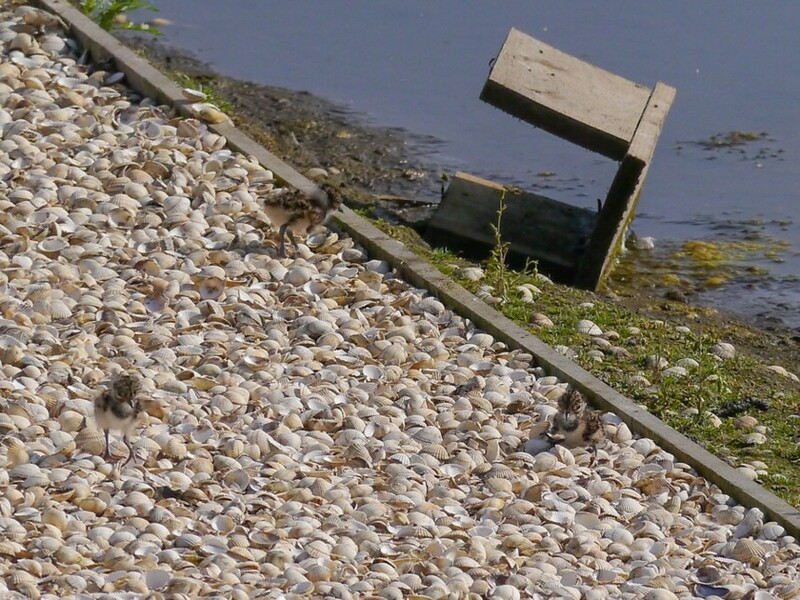 The three Lapwing chicks survived their first night and had been led, in the afternoon, by the adults from the shingle scrape to the first scrape. 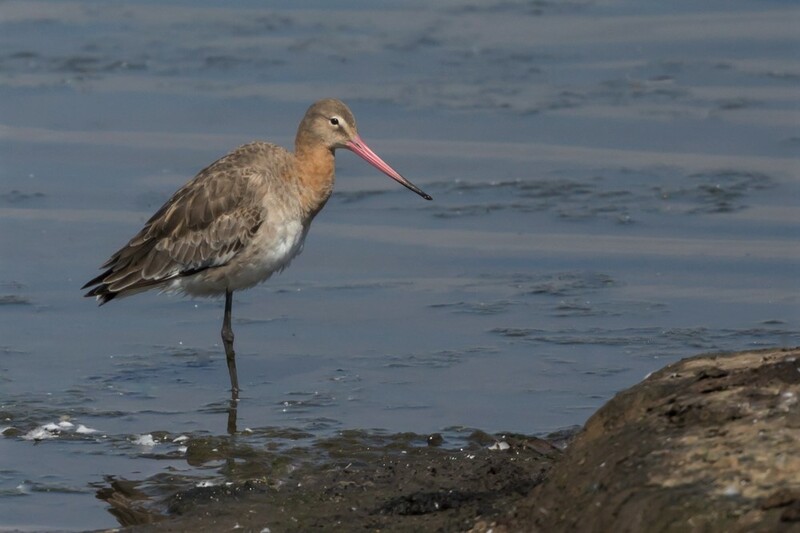 Other sightings included 2 Black-tailed Godwits and 3 juvenile Black-necked Grebes. Sightings today included 1 Common Sandpiper, 1 Common Tern, 1 Black-tailed Godwit and a pair of 2nd summer Mediterranean Gulls. 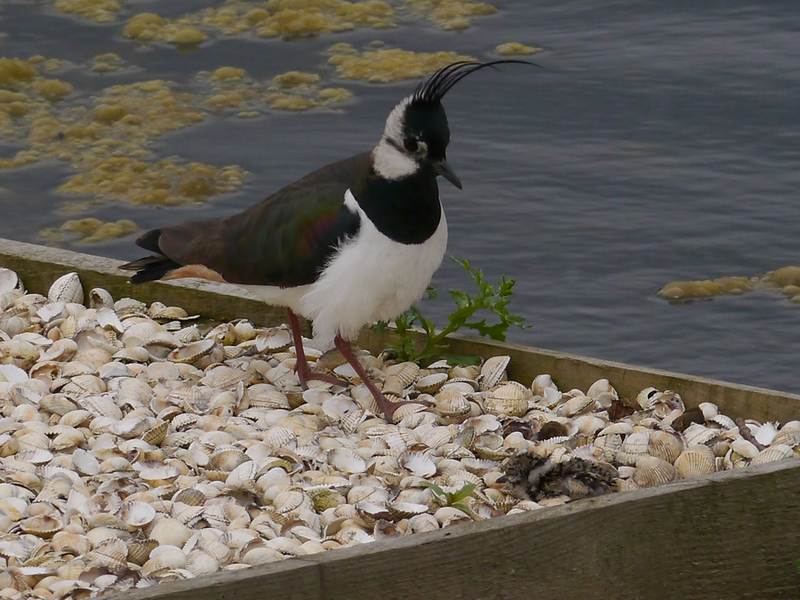 The highlight though was the hatching of the Lapwing chicks on the shingle in front of the John Morgan Hide. The first chick hatched at 09:00 and by 12:00 there were at least two, although they spent almost all the time hidden under the adult female. The male was busy harassing any gull or corvid which ventured onto the scrapes. The chicks were still present this evening being sheltered from the heavy rain by the female. Well, a total of twelve hours spent produced a wide variety of sightings. Starting with Friday evening’s moth-trapping and bat-surveying, with a good bit of birding thrown in. Highlights of the evening were the bats, with: 14 Soprano Pipistrelles, 5 Common Pipistrelles, 2 Noctules and a possible Daubenton’s. They were joined by a Hobby, which, as last year, was trying to catch bats in the half-light. Then, home before 1.00 am for four hours sleep and back at 6.30 am, to check the moth-traps. A decent catch of moths for a cloudless night, then we found the seventh brood of Pochard so far this year, along with 3 Ruddy Ducks and the usual Black-necked Grebes, plus a single Black-tailed Godwit. Then, onto No.1 bed to confirm breeding by the Peregrines, which had at least one visible young at the nest and to do a short dragonfly survey, which produced: 17 Four-spotted Chasers, 1 Large Red Damselfly and scores of “blue” damselflies to go with the stunning male Banded Demoiselle we’d found earlier on No.3 bed. The best, though, was saved for last, when, after lunch on No.3 bed, a thunder storm brought in a Common Tern and David Spencer found a drake Garganey in front of the South Screen. 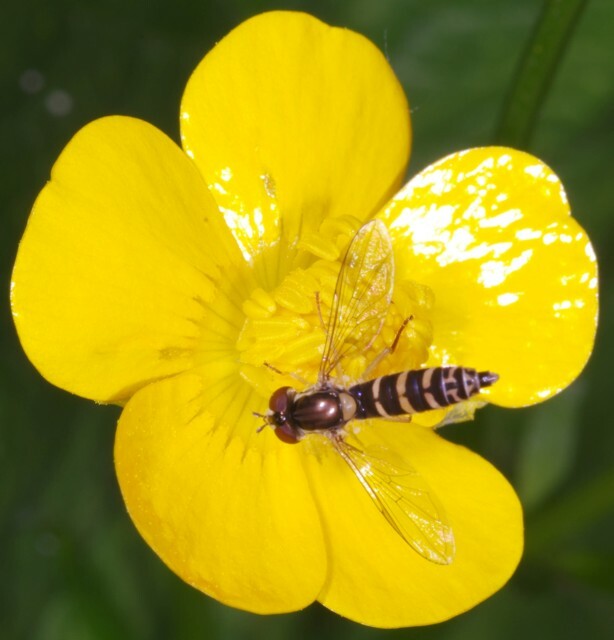 This hoverfly is Eristalis intricarius. 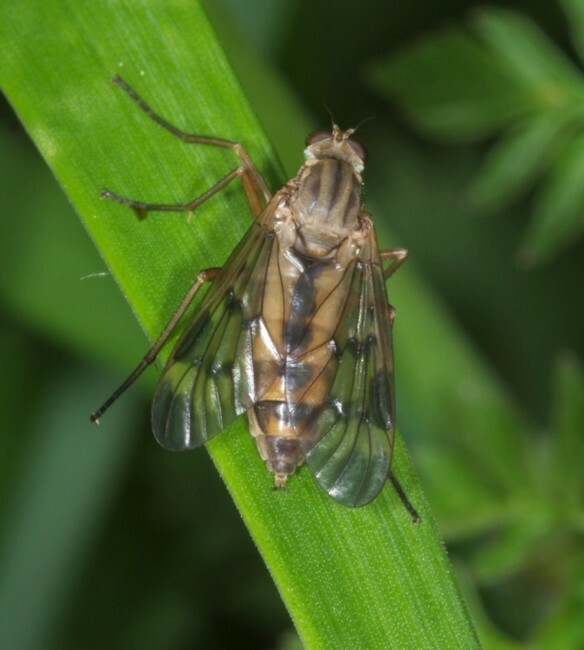 A quick ID feature can be seen - if you look at the second wing vein near the tip of the wing, it has a pronounced squiggle. This is characteristic of the Eristalini, (8 genera) and can save a lot of time wading through keys. 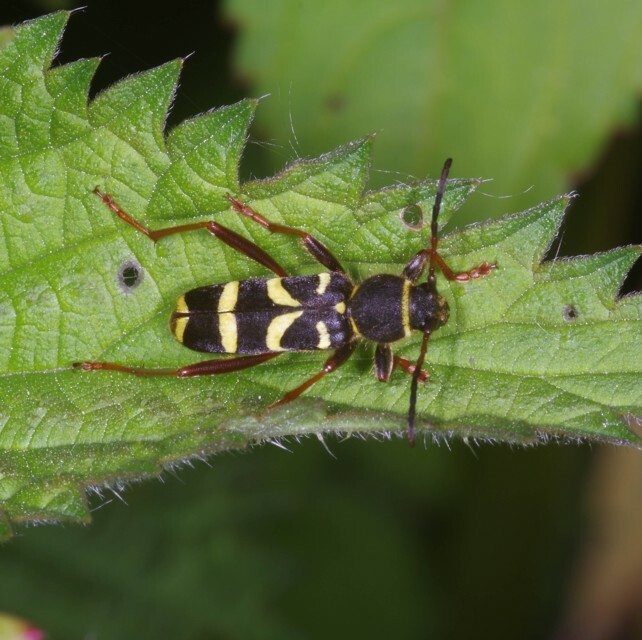 The wasp beetle, Clytus arietis. 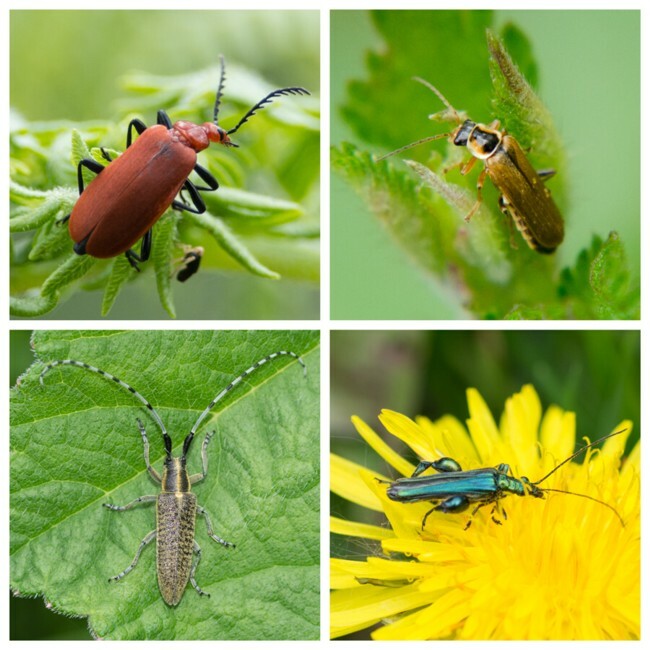 There are very few longhorn beetles found commonly in the northwest, most of them are insects of southern ancient forests. 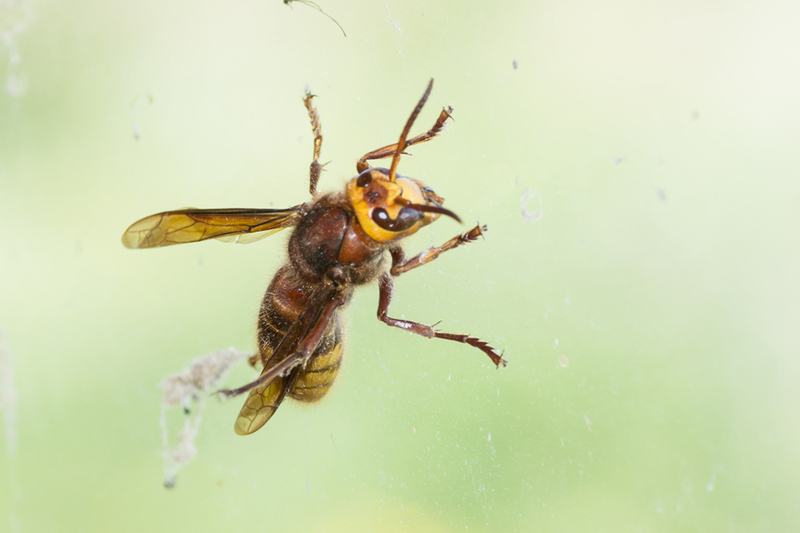 The wasp beetle has a fondness for Wisteria which probably helps it establish itself further north. 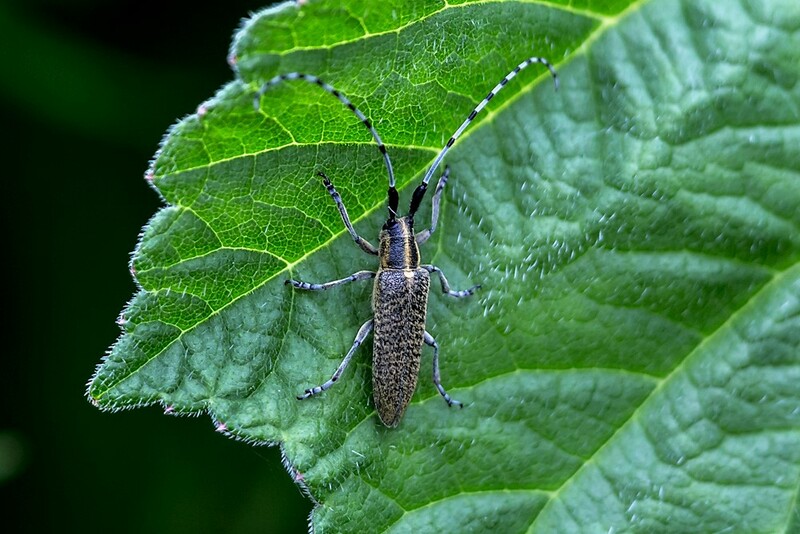 The other longhorn which is beginning to become very common here is Agapanthia villosoviridescens - see sightings already submitted. Agapanthia larvae feed in thistle stems. The malachite beetle Malachius bipustulatus. 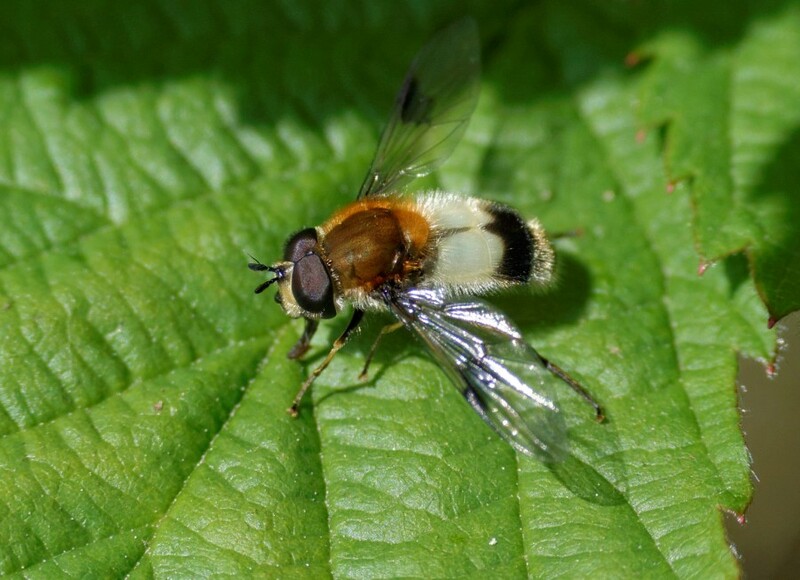 The hoverfly Sphaerophoria scripta. 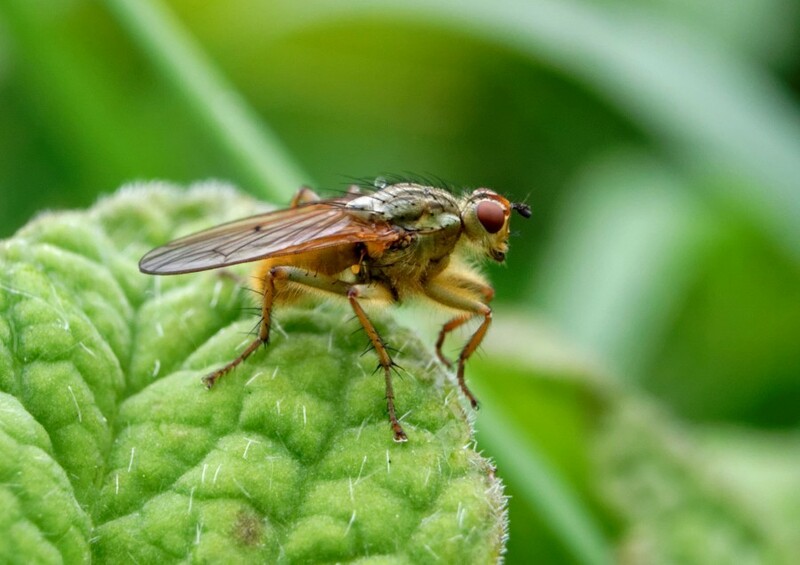 Sphaerophoria are usually quite difficult to identify, requiring microscopic examination, but scripta is easy as it’s the only species whose abdomen is substantially longer than the wings - it protrudes when the wings are folded. 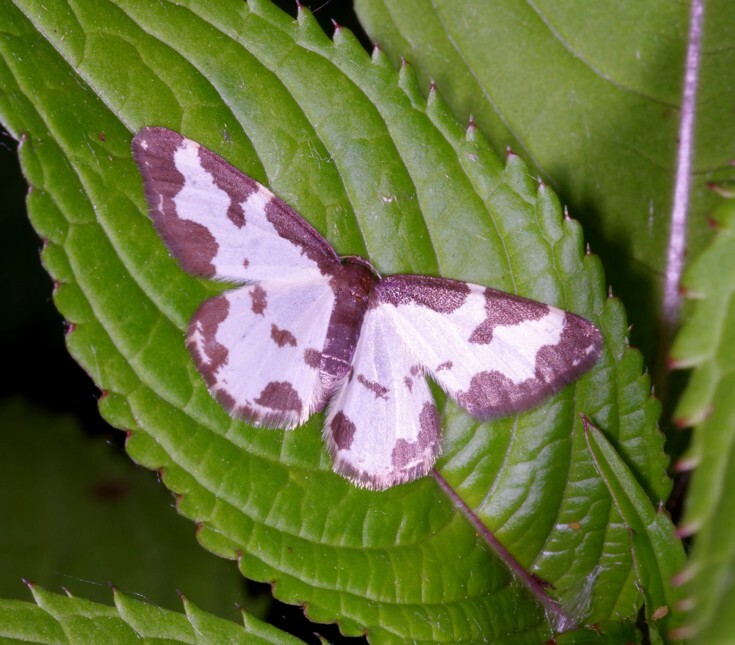 The Clouded Border, Lomaspilis marginata. The cranefly Tipula oleracea. 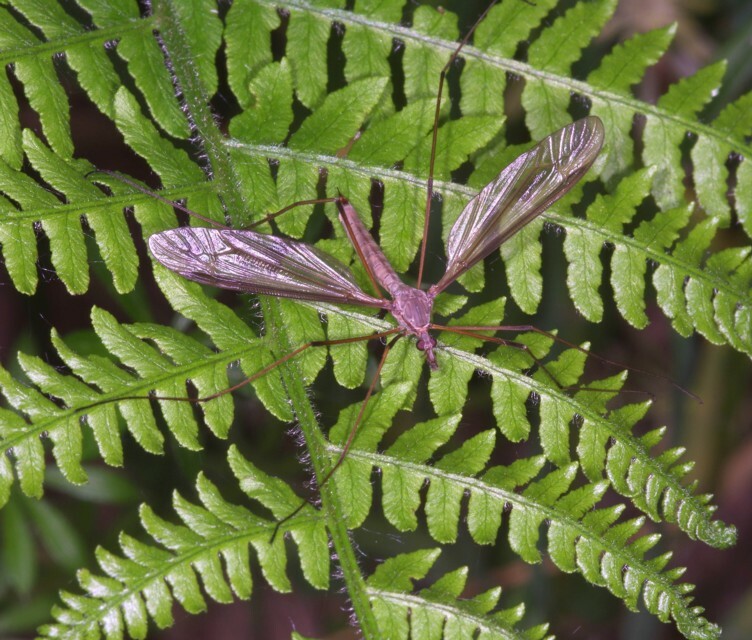 This is the cranefly most likely to be seen in spring. The very common species emerging in late summer is Tipula paludosa. 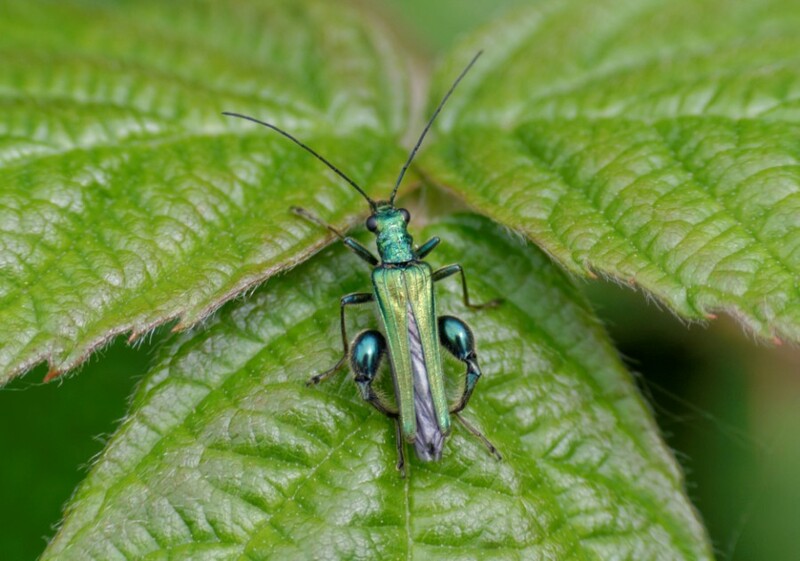 Oedemera nobilis, the “swollen-thighed flower beetle”. Only the males have the swollen thighs. 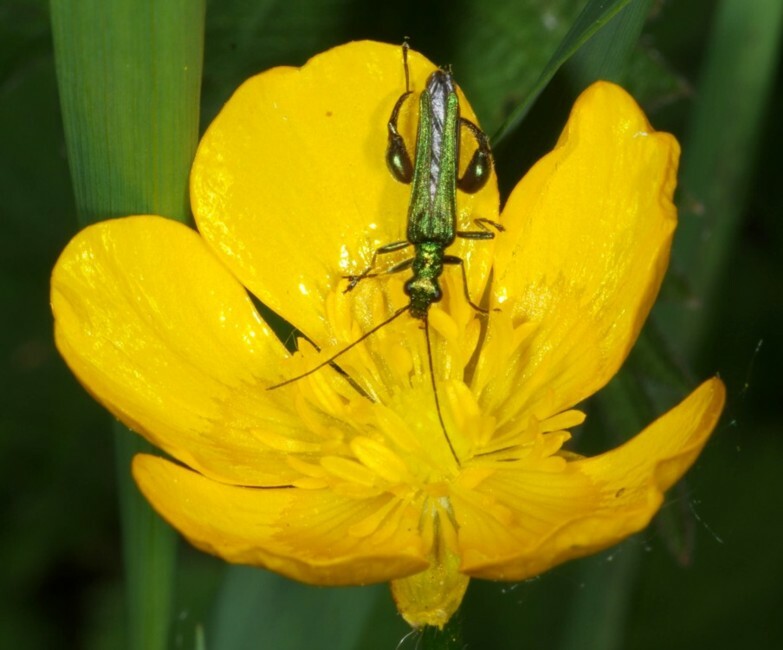 Oedemera lurida is also present on the reserve, it’s slightly smaller and a more dullish green/bronze. And the males have normal thighs! 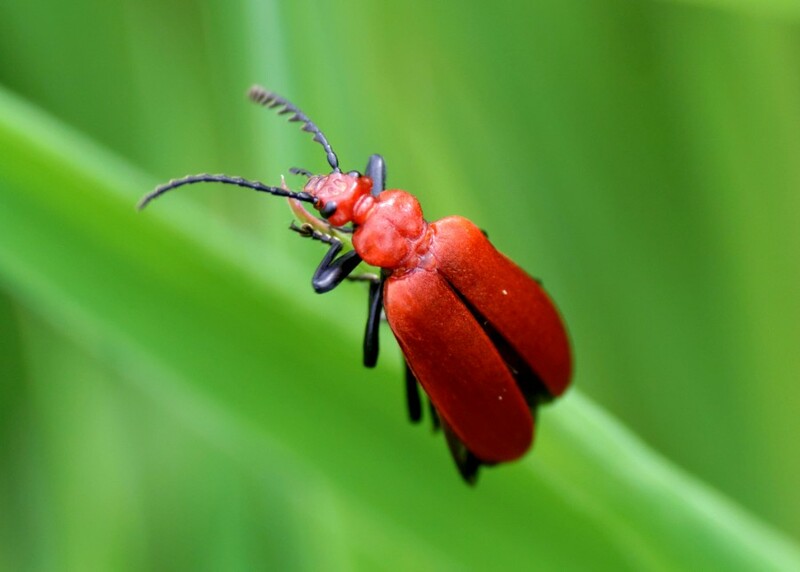 The nettle weevil Phyllobius pomaceus. 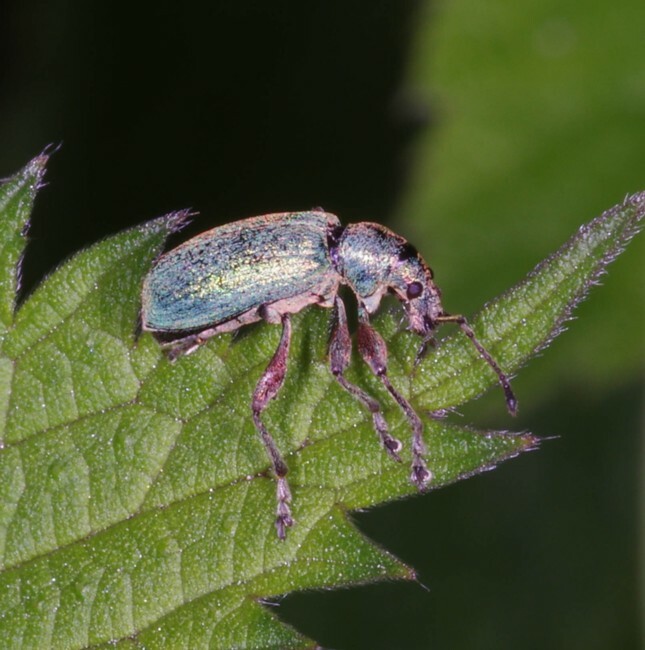 There are a number of these metallic green weevils in the genera Phyllobius and Polydrusus. This species usually has a characteristic bluish tint. It’s much easier to identify at this time of year than in late summer when all the scales have worn off! 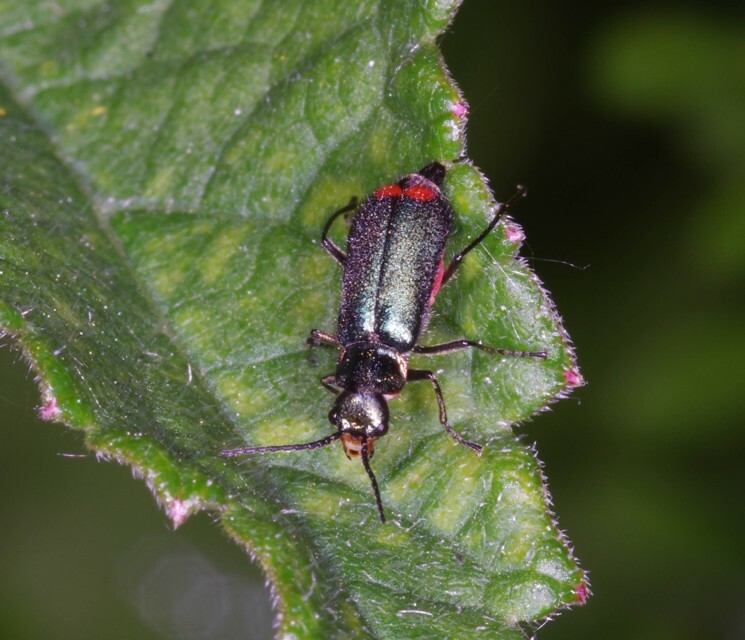 The click beetle Athous haemorrhoidalis. 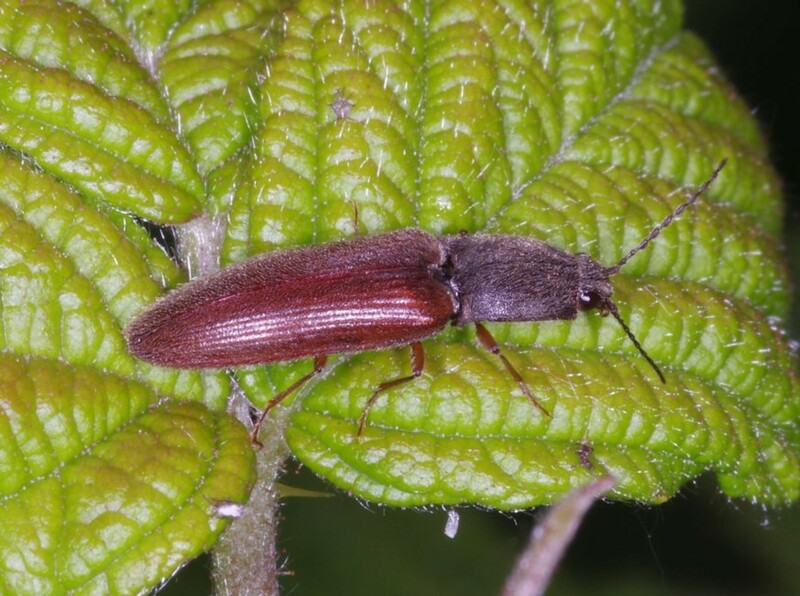 Probably the commonest British click beetle. These elongated spiders are Tetragnatha species. 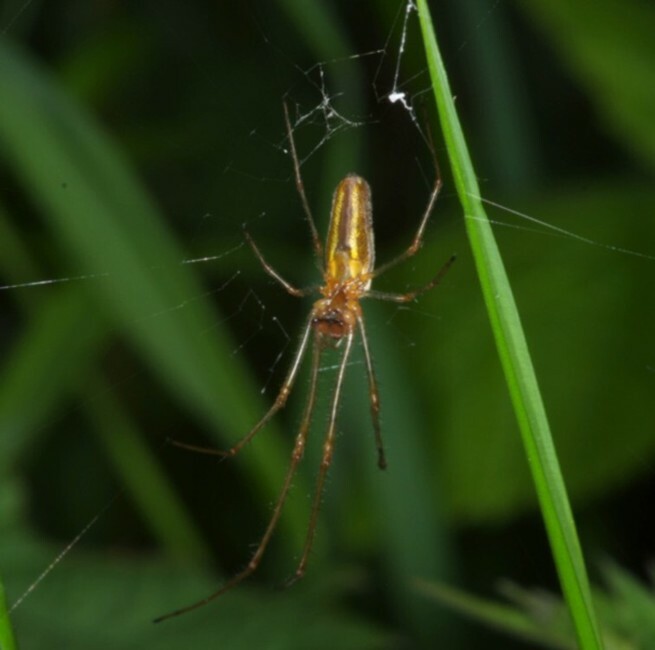 This one is probably Tetragnatha extensa although a closer look would be needed to be sure - there are eight European species. 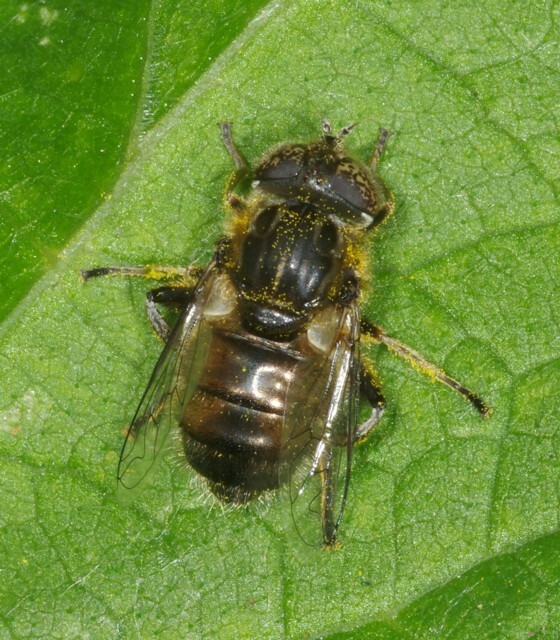 The Soldierfly Rhagio Scolopaceus. 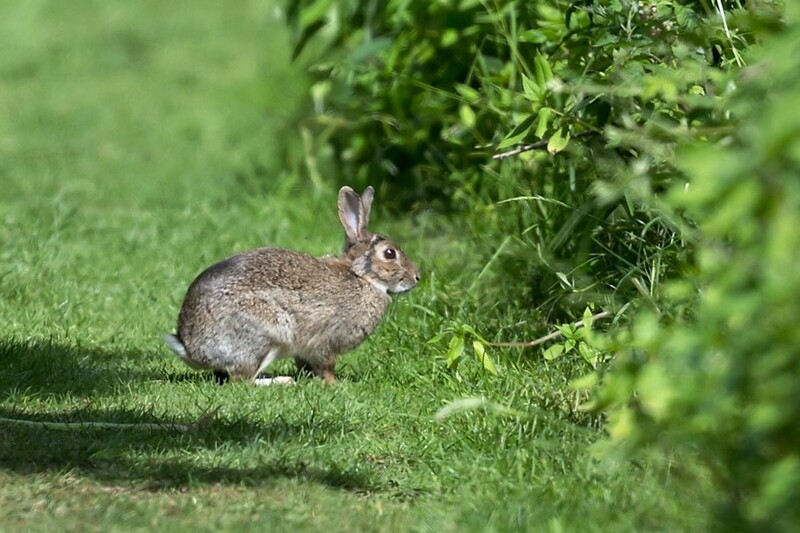 Very common on the reserve at present. 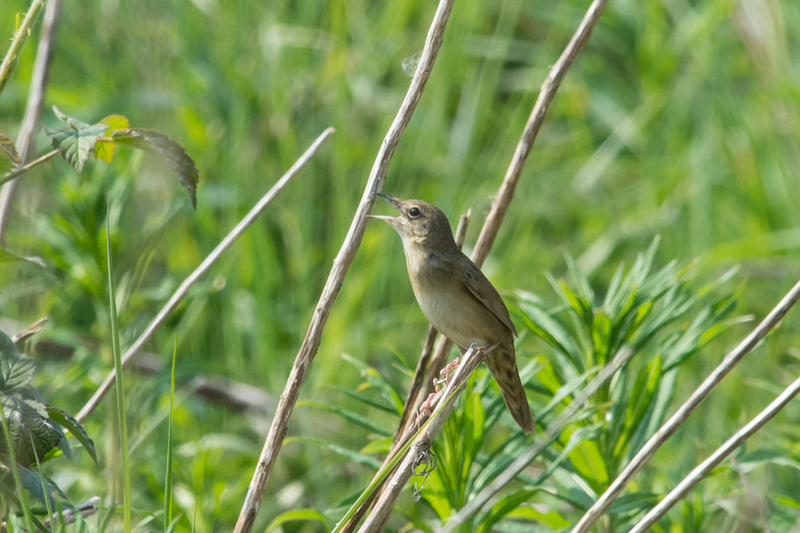 A quiet morning on No.3 bed today, though it started well with a Cuckoo cruising over the reed bed. Mainly spent counting wildfowl broods and getting a feel for the number of visible Black-headed Gull nests around the bed. Most of the gull nests are within the cover of the reeds and we’re hoping to conduct a drone survey of the nests, for the first time, soon. Nevertheless, I still managed to find 83 nests visible from the perimeter of the bed, with 6 small young dotted around. Less pleasing was watching, for the first time this breeding season, a Lesser Black-backed Gull, catching and swallowing a well-grown Coot chick. Finished with an hour’s insect photography and a Little Ringed Plover in front of the Morgan Hide. With migration now largely over, it was largely about checking for early broods of wildfowl on No.3 bed this morning. 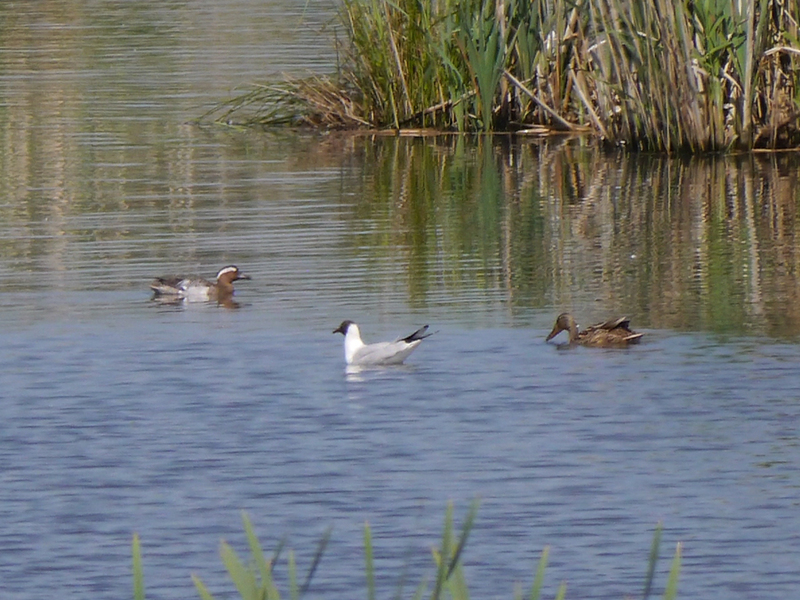 Most pleasing were the five early broods of Pochard (of 4, 5, 6, 8 and 3 young respectively.) 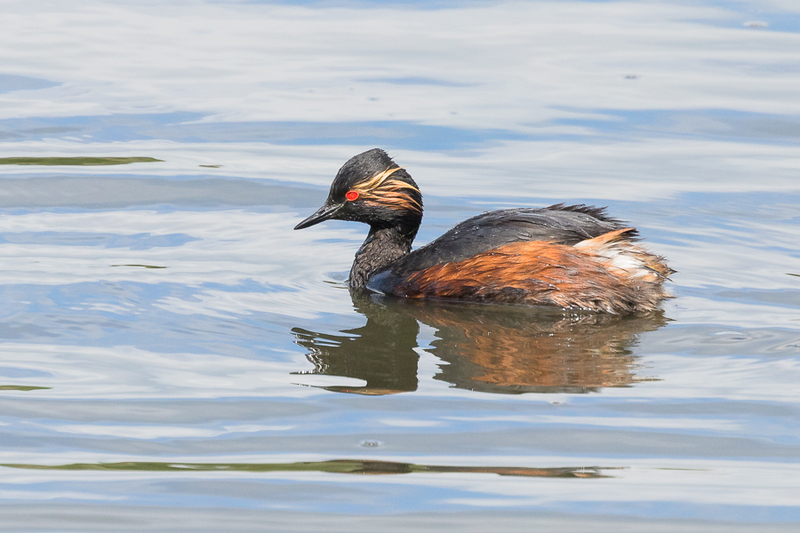 In addition, at least 10 adult Black-necked Grebes, with 4 small young, were visible from the Morgan Hide. The three drake Ruddy Ducks were still sailing around bed looking unsuccessfully for mates, Coot broods must now be approaching double figures and perhaps less pleasingly, the exceptional numbers of Canada Goose young (with the large creche still holding about 40 chicks) were still very evident. Other birds of note were two Mediterranean Gulls, a soaring male Peregrine, 60 Swifts and about 70 hirundines, mainly Sand Martins. Thanks to Keith G. for spotting this one ! 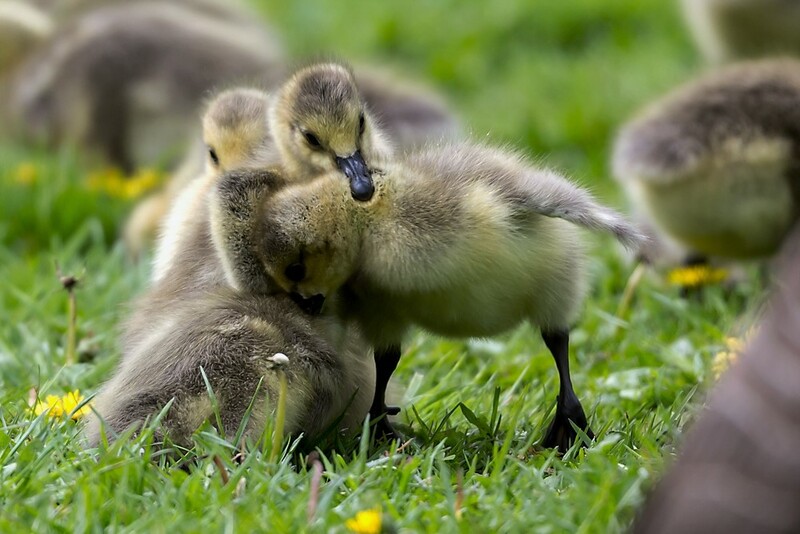 Canada gosling showing plenty of attitude already as one grabs its sibling by the scruff of the neck ! We met at 6.30 am this morning, in perfect spring weather, to conduct our second breeding wildfowl survey of the year, on No.3 bed at Woolston Eyes. Highlights were: 10 -12 adult Black-necked Grebes with 5 young and with, probably, some more females on nests ; 6 - 7 pairs of Little Grebe plus one small young; a few pairs of Great Crested Grebes, though with,as yet, no indication of breeding; 3 unattached drake Ruddy Ducks; 2 drake Teal which looked like they had sitting females nearby; good numbers of pairs of Tufted Ducks and Pochard, the latter with a brood of 5 already on the water; unprecedented numbers of Canada Goose young (the main creche held 42 young yesterday! ); masses of Gadwall and a few Mallards. Other birds of interest were: 2 Common Terns which visited for the second successive day (we presume) but today one of them at least touched down briefly on the shell island before being led away to the north by its mate; a hunting male Peregrine away to the east and a Water Rail which showed briefly in the north-east corner. 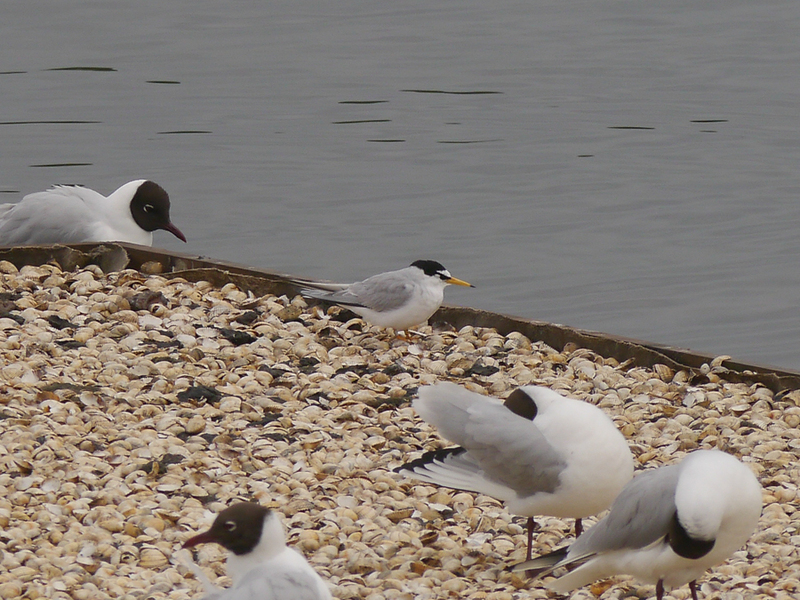 An intermittent light drizzle this afternoon brought in two Common Terns to No.3 bed, with two more having been reported earlier in the day by David Spencer. I had the same experience with the geese this afternoon Dave, not only on the way in but also on the way out of john Morgan hide I was blocked off down both paths !! I proceeded with caution to avoid a nasty nip. I must have looked funny with my arms up saying “easy guys , easy”!! They were very tetchy. 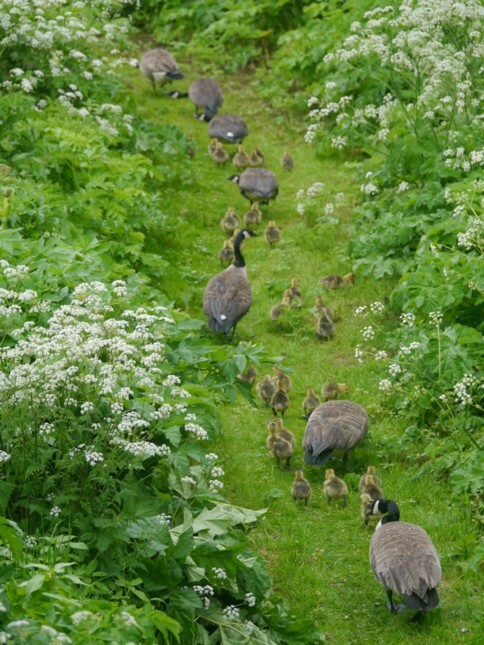 7 adult Canada Geese and 32 goslings were blocking the path to the Morgan Hide this morning! During this morning’s heavy rain a Little Tern flew in and roosted on the shingle island, making occasional fishing forays. Unfortunately after half an hour, when the rain cleared, it flew off high Northwest. It had a yellow darvic ring on the left leg; initial thoughts are it originated from the Isle of Man. 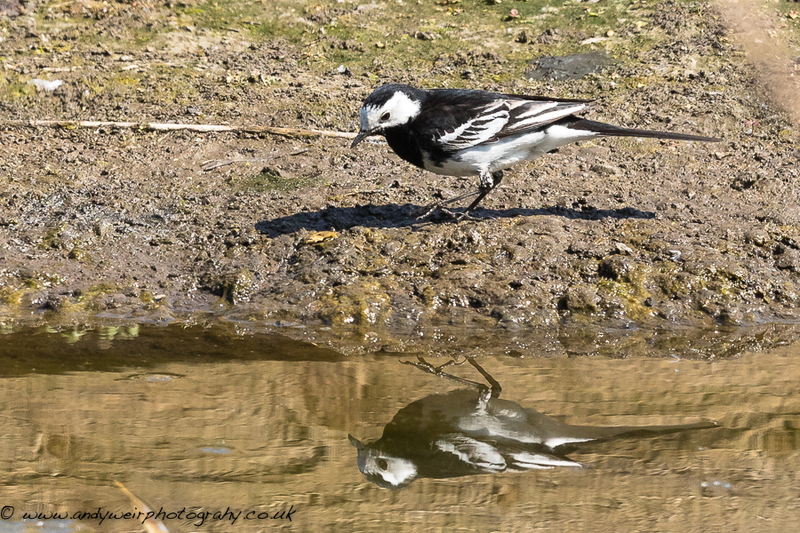 A nice few hours on No.3 bed this afternoon, watching the comings and goings in front of the Morgan Hide. 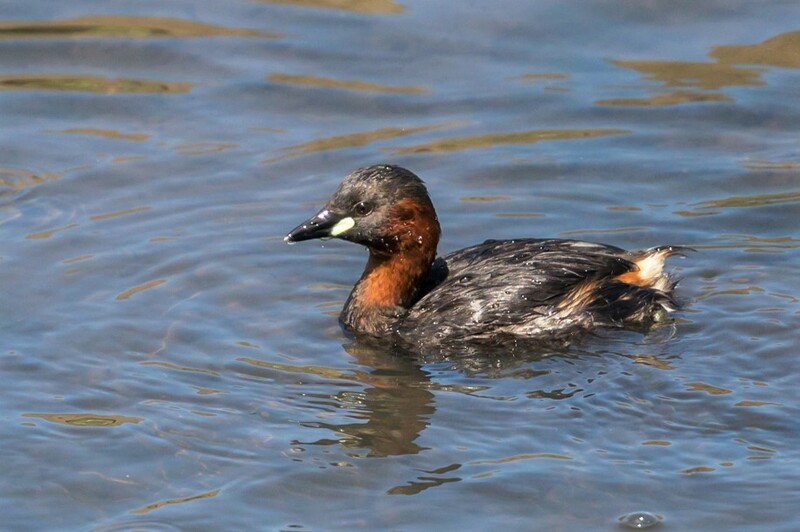 Two pairs of Black-necked Grebes were feeding young and the three Ruddy Ducks were still cruising the bed in the forlorn hope of finding a mate. 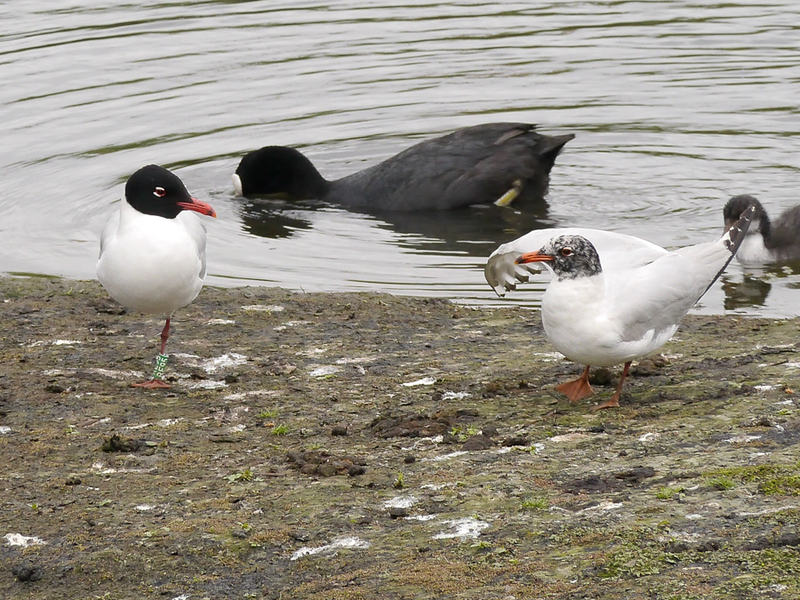 A similar situation also seemed to apply to the second-summer Mediterranean Gull which was displaying to any Black-headed Gull which showed a passing interest. Heavy, mid-afternoon showers then brought down several hundred Swifts and hirundines, with an accompanying Hobby. The latter went rattling along the north bank before pitching into the trees, out of the rain. 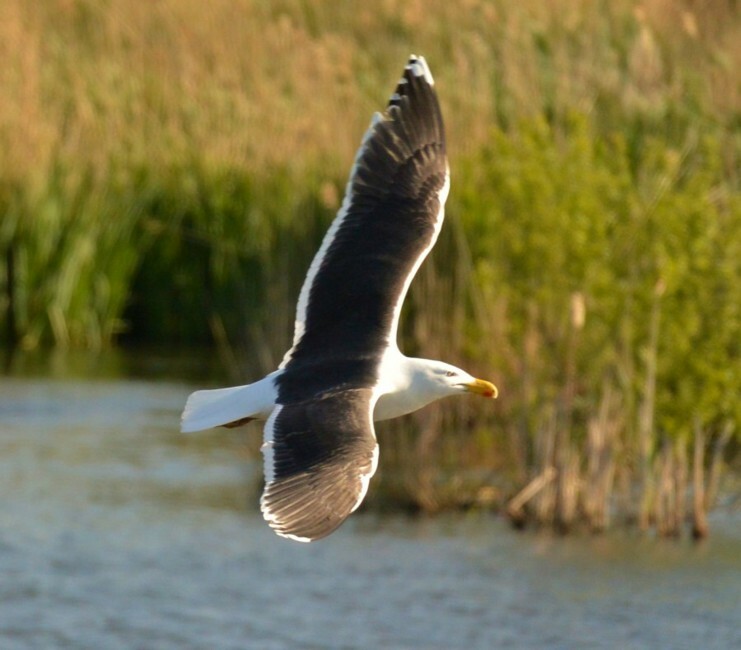 Click here to view the map of sightings of this gull……. 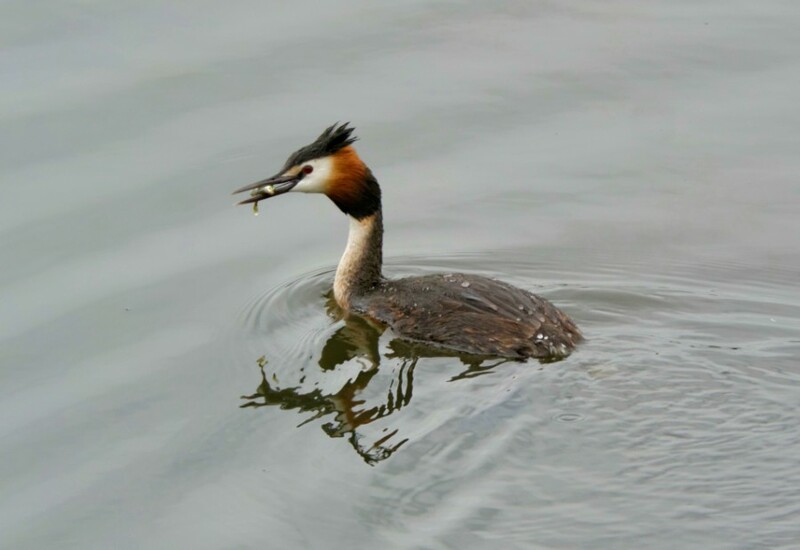 Breeding is now in full swing and our first sighting, at 6.30 am this morning, from the screen on the south bank of No.3 bed, was of three male Ruddy Ducks on a collective hunt for a female, and a pair of Black-necked Grebes feeding one young. Subsequent sightings of interest included a fly-through Little Ringed Plover, a pair of Mediterranean Gulls which landed on the Morgan Hide scrape, a Garden Warbler which showed really well on the west bank, two Cetti’s Warblers in song, a cruising Peregrine Falcon, our first Pochard brood of the year and 150 Swifts, plus scores of hirundines feeding voraciously overhead. 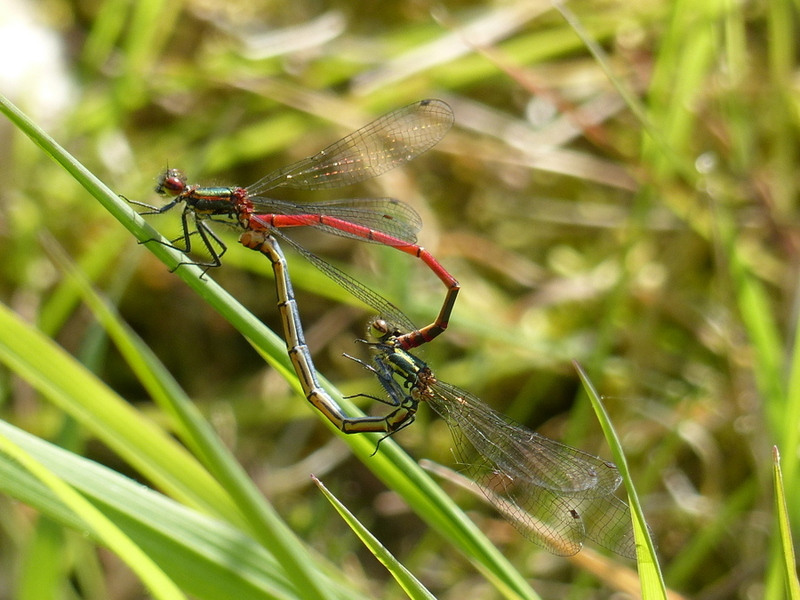 The warm sunshine has brought out the first of our damselflies this week,including a pair of Large Red Damselflies seen today on No.1 bed. Another glorious spring day at Woolston. 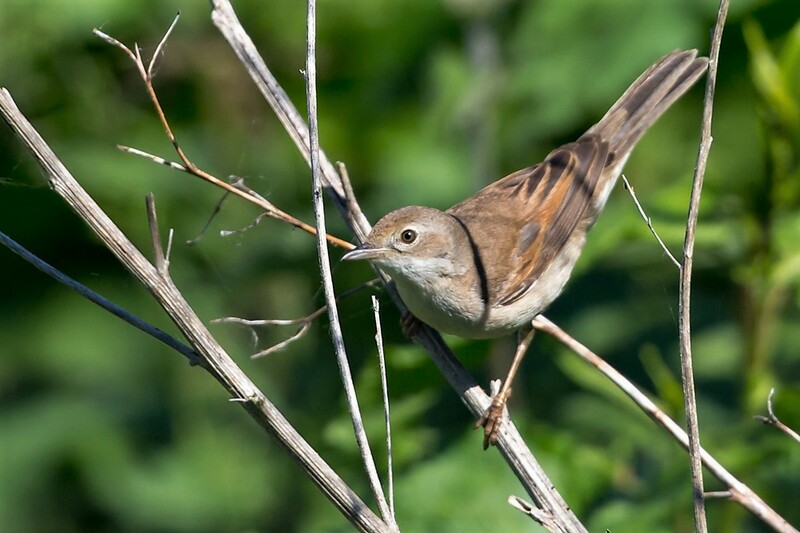 Garden Warblers were in song on both No.1 and No.2 beds. The Sand Martin colony on the canal held about 20 birds. 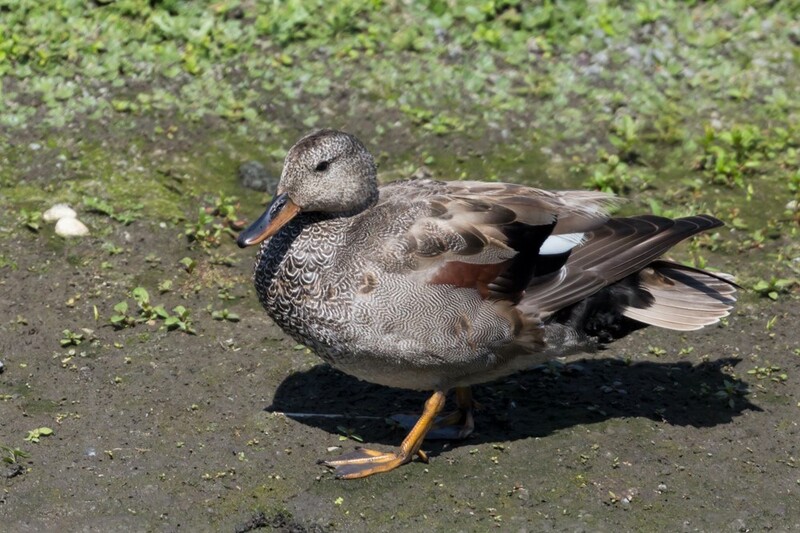 I found five Mallard broods with a total of 40 young and Canada and Greylag broods were plentiful on No.3 bed where the male Ruddy Duck was showing well. 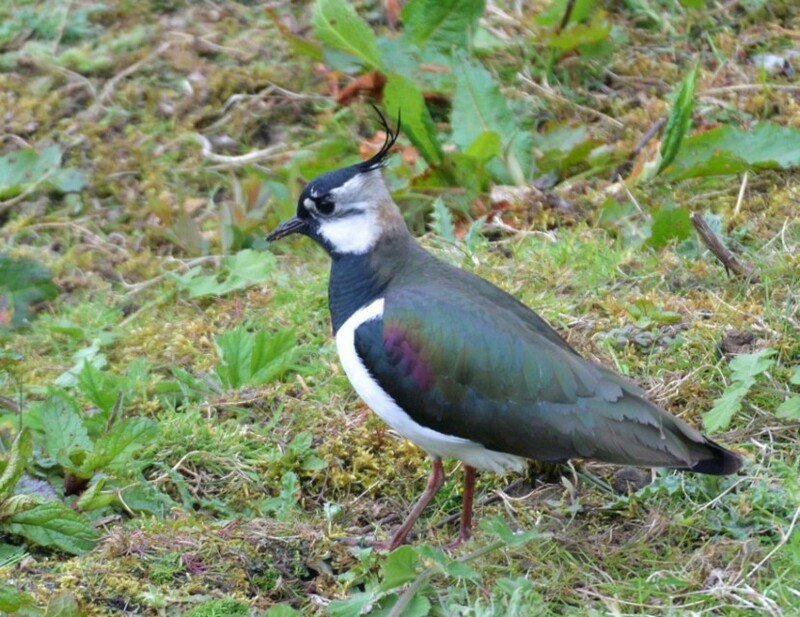 Three pairs of Lapwing were present on No.3 bed and two on the Loop. The fields to the north of No.2 bed still had a pair of Little Ringed Plover and a singing Cetti’s warbler. Amongst the more common butterflies were my first Large White and Small Copper of the year. 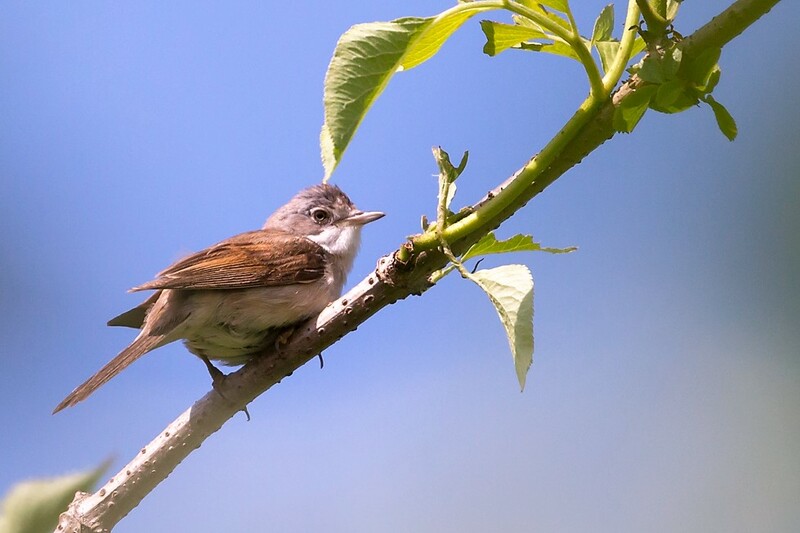 There was only one record of the latter species last year so hopefully its fortunes will improve! A worrying sighting was of 32 Lesser Black-backed Gulls on the Loop of No.4 bed where broods of Mallard and Coot seem to have disappeared. 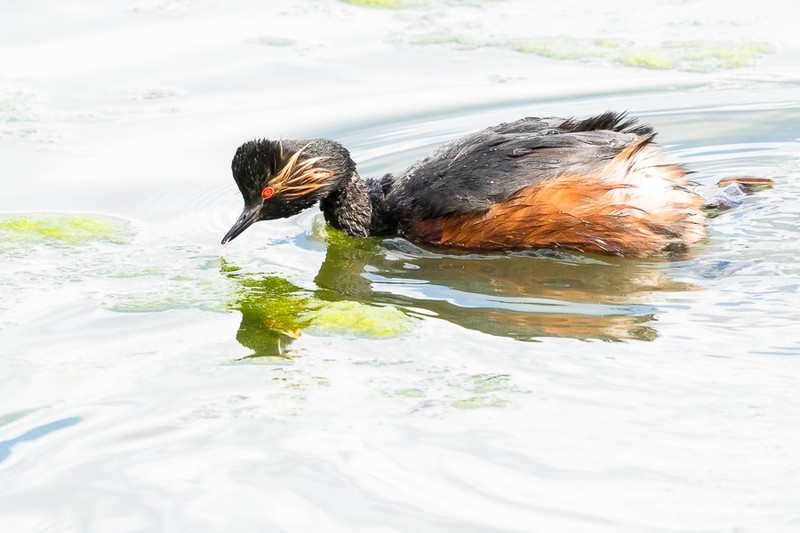 So, as well as the two Kittiwakes reported from this morning (found by Bob Dickinson), its pleasing to report that our Black-necked Grebes now have at least three broods, with a minimum of 11 adults noted. 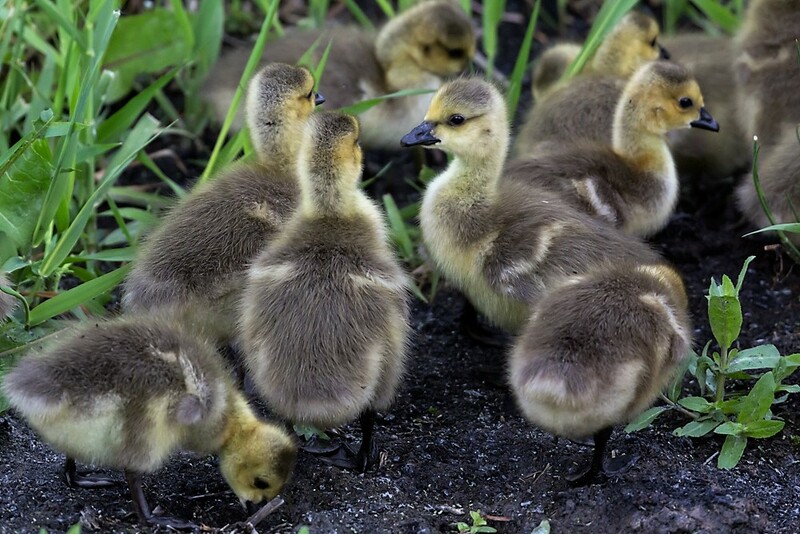 This is early, compared with most years and they may be able to double-brood if the weather holds. 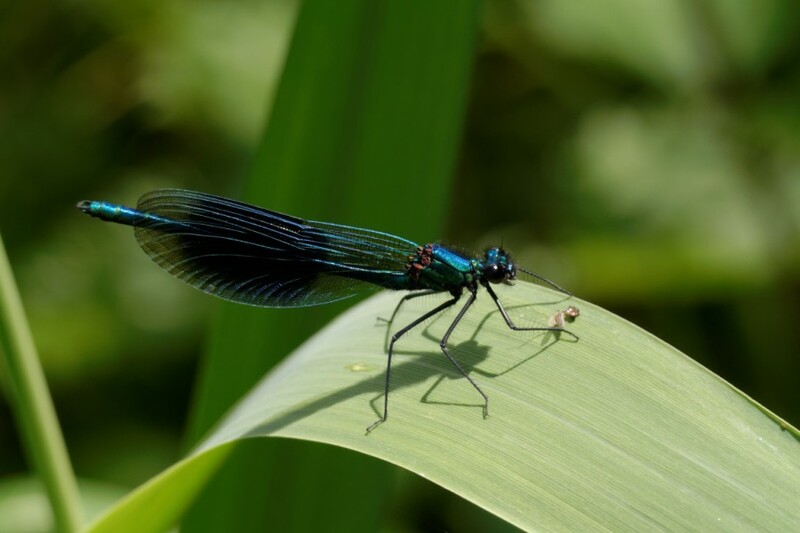 Otherwise, it was nice to note a small hatch of six Azure Damselflies by the Footbridge onto No.3 bed. 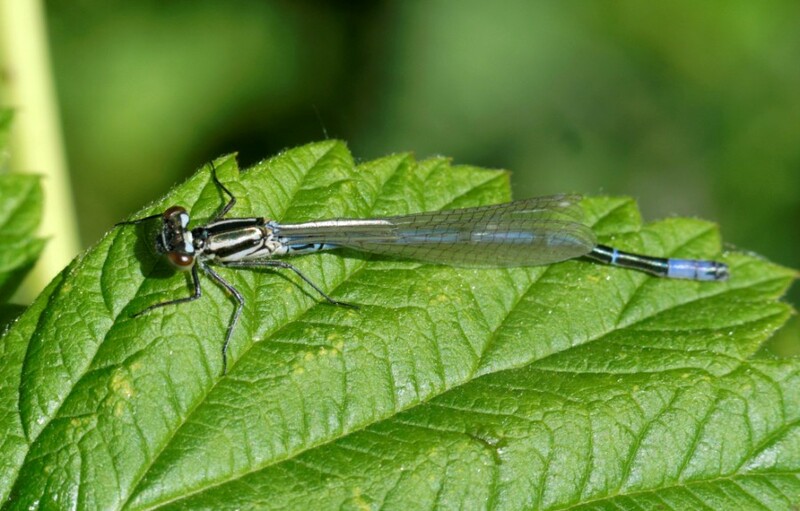 Photo of an Azure Damselfly from this morning. A wonderful, if cool, spring morning, with a record 76 species recorded from No.3 bed, with the addition of an always scarce House Sparrow from the entrance to No.4 bed. The day started well with an influx of Swifts, which accrued steadily over the morning till c.150 had passed through. 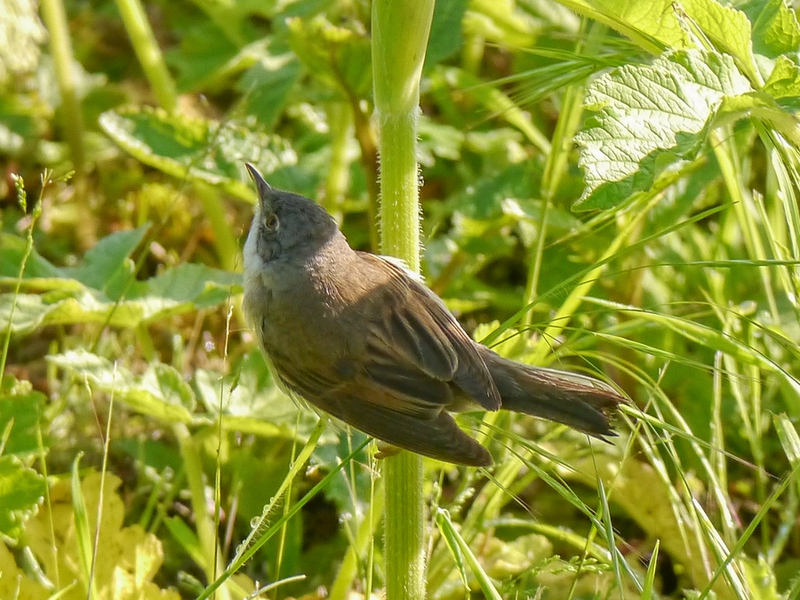 Warbler highlights on the bed included: 1 Lesser Whitethroat, 1 Garden Warbler,1 Grasshopper Warbler, 2 Cetti’s Warblers, 1 Sedge Warbler, 17 Reed Warblers, 14 Whitethroats, 8 Blackcaps, 8 Willow Warblers and 10 Chiffchaffs, Best sightings though, were of 3 Black Terns, which dropped in briefly to feed before climbing away to the east, 8 Whimbrels which slid silently eastward over the north bank and the second Cuckoo of the spring. 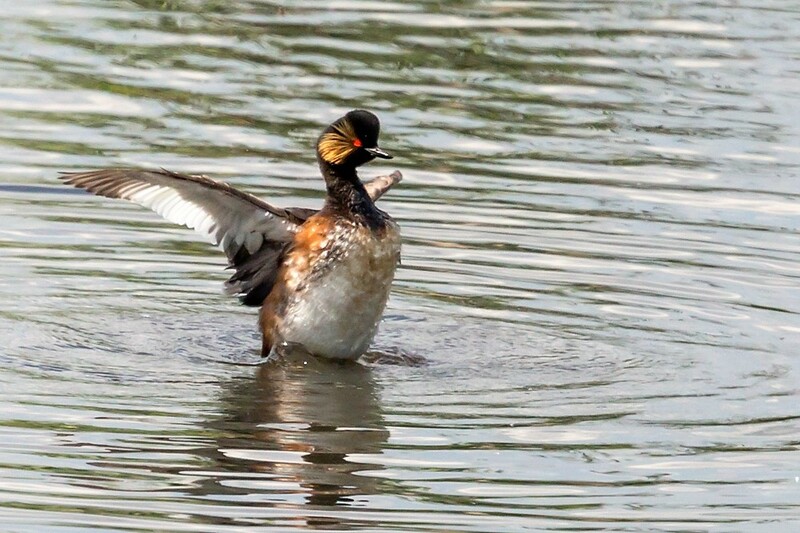 Other regulars included a drake Ruddy Duck, 2 Mediterranean Gulls and the usual Black-necked Grebes. Overflying Siskin and a feeding Redwing were also interesting sightings, as was an early Black-headed Gull chick on one of the nesting rafts. 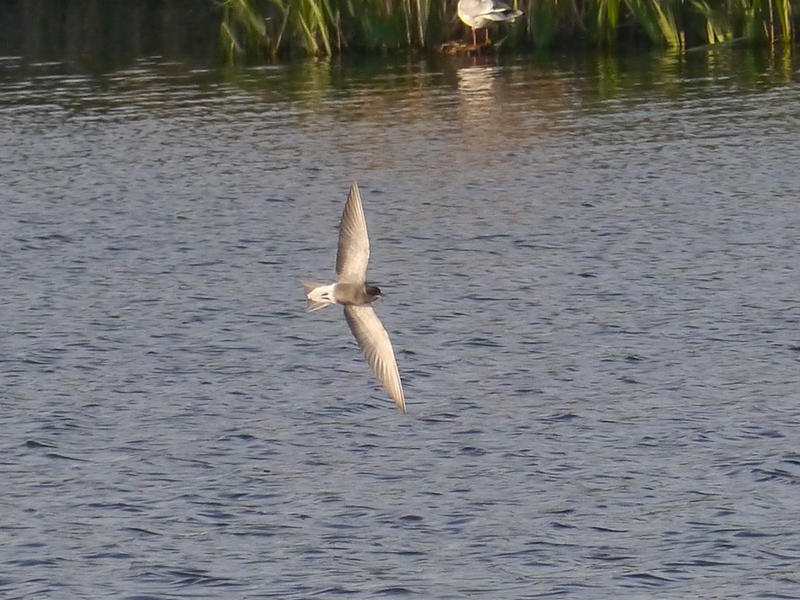 The link is to a short video clip is of the Black Terns. I started the day with a breeding wildfowl survey on No.4 bed and there was a good variety on the loop with a pair of Shoveler and a single male raising hopes that last year’s breeding might be repeated. A Common Sandpiper was at Latchford Locks and a colony of about 20 Sand Martins was on the south bank of the canal opposite No.1 bed. 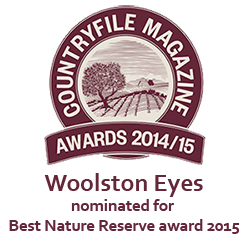 On No.1 bed a singing Skylark appeared to be on territory and a Hobby flew north from Butchersfield Tip. To the north of the river a pair of Little Ringed Plover was in the flooded fields and a Cetti’s Warbler, first seen last week, was still in song. An interesting sighting was a Holly Blue to the north of No.2 bed. About 35 white butterflies appeared to be mostly Green-veined Whites. 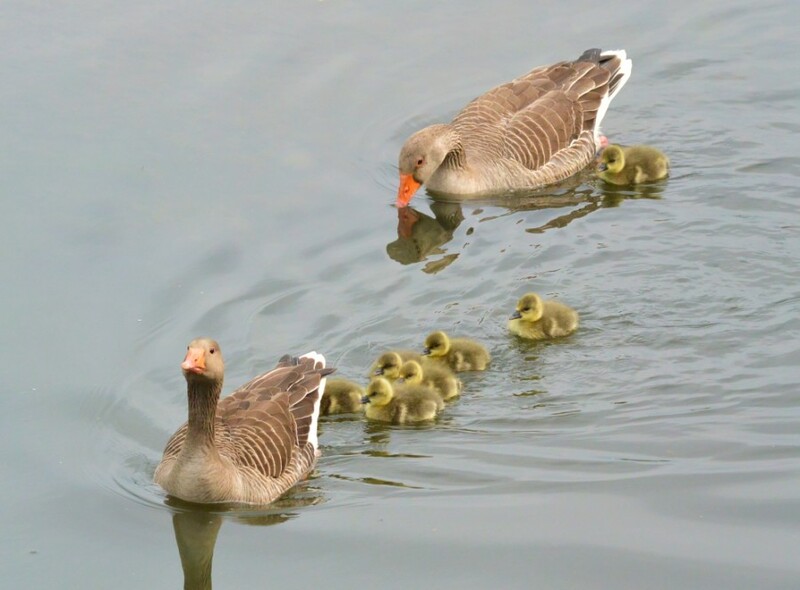 Photo of Greylag Geese with brood from No.3 bed. 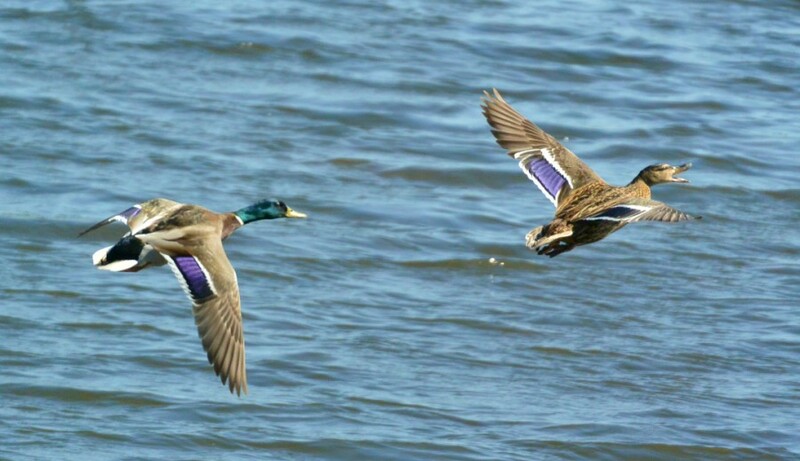 Flight shot of a pair of Mallards from yesterday on No.3 bed. 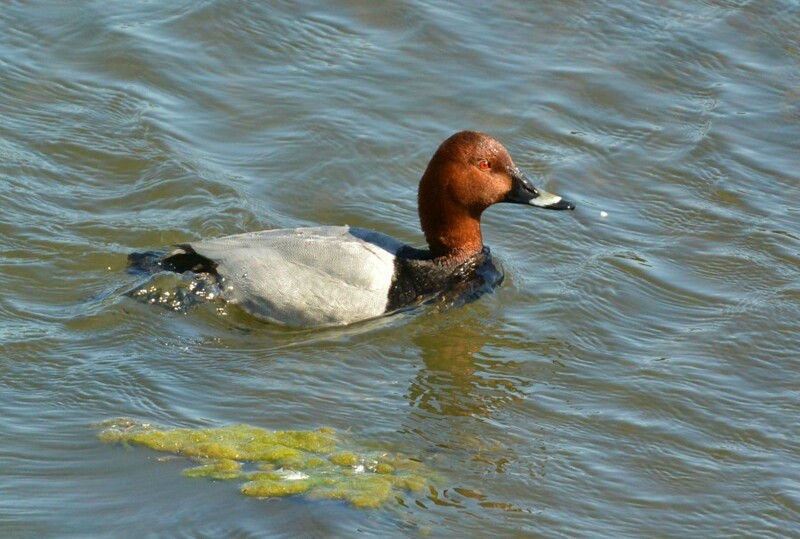 Photo of a drake Pochard from No.3 bed yesterday. Yesterday, during a blustery morning on No.3 bed, the gusty north-easterly winds seemed to be holding back migration. Despite this we managed to pick up three Whimbrels passing east and a Hobby moving in the opposite direction, along with the odd hirundine. Otherwise, breeding was in full swing, with new broods of Mallard and Coot, five broods of Greylag Goose and one of Canada Goose and the female of the Lapwing pair on the Morgan Hide scrape now sitting on a nest. 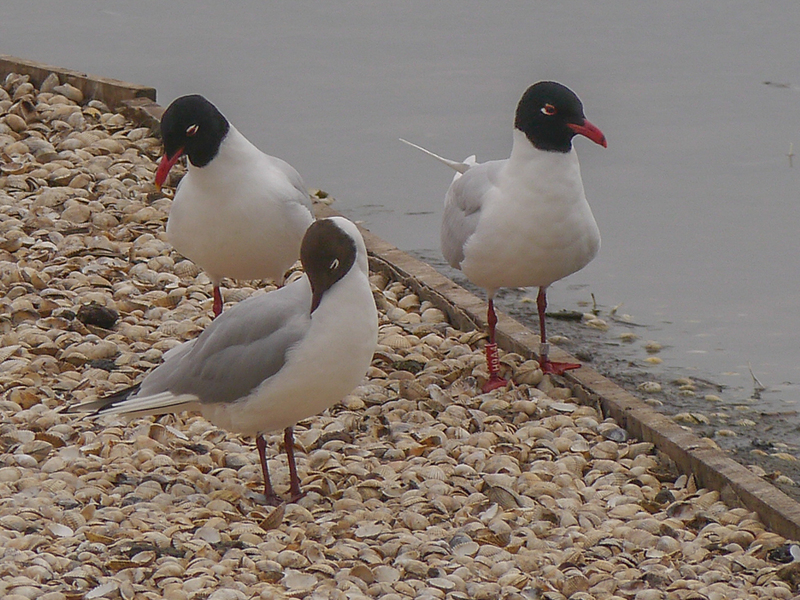 The regular Great Black-backed Gull plus a few Lesser Black-backs were causing the usual consternation in the Black-headed Gull breeding colony, where scores of nest sites are now occupied. 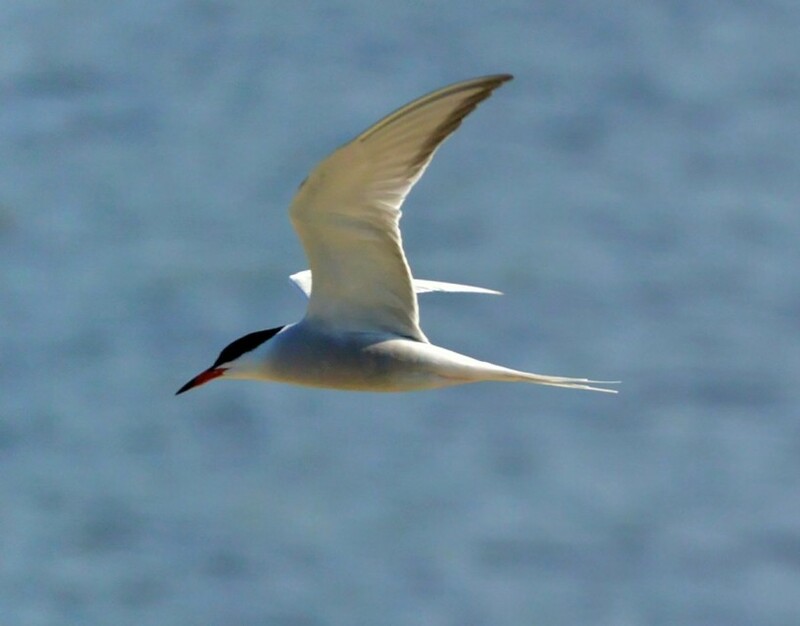 When the winds are in the east at this time of year and there’s a chance of rain, it’s tern weather! So, George Dunbar and I headed down to No.3 bed at 6.30 am this morning, hoping for a Black Tern or two. 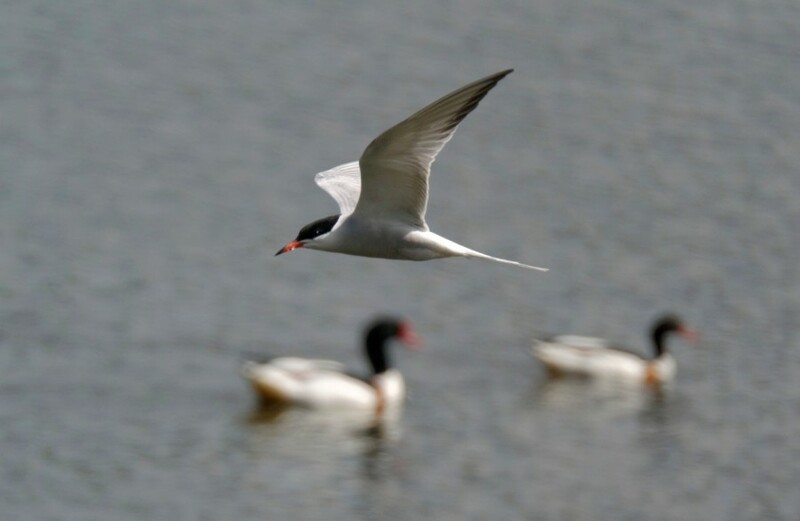 Terns are never common at Woolston, but the right weather conditions can usually be guaranteed to bring through a handful, whether Common, Arctic or Black. 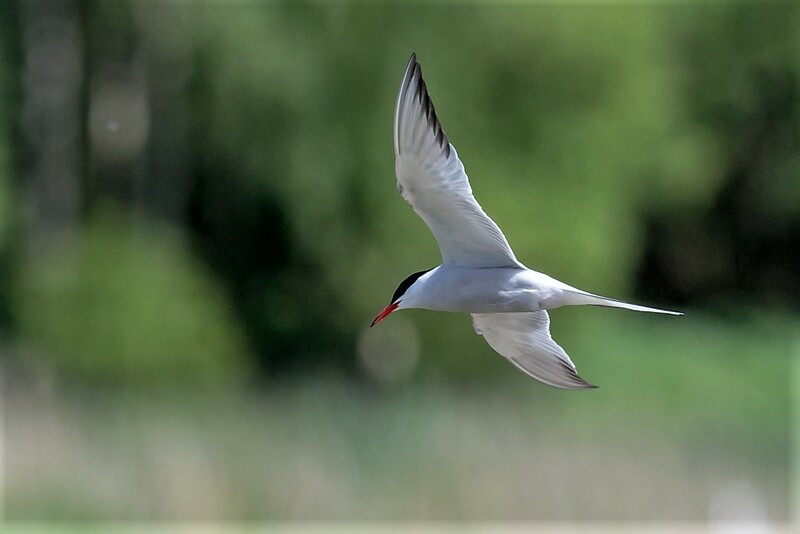 Imagine my surprise when, at 9.00 am, I picked up a large flock of birds moving east over the north bank of the bed, raised my binoculars and saw 47 Arctic Terns - an unprecedented count for us. 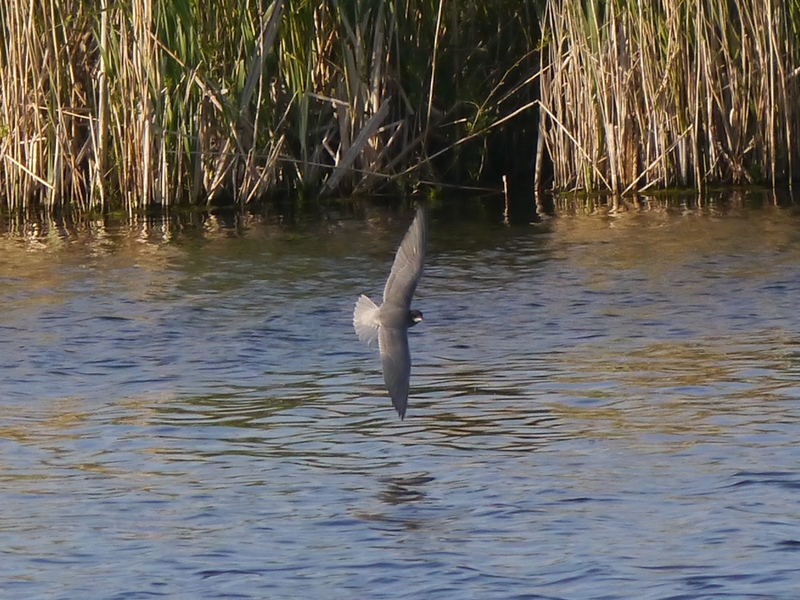 Not since we had an arrival of 105 Black Terns, many years ago, have we had a better tern sighting. Despite much further scanning the only other birds of note were: 2 Mediterranean Gulls, 1 drake Ruddy Duck, a few Black-necked Grebes and a steady passage of all three hirundines.